Gov. 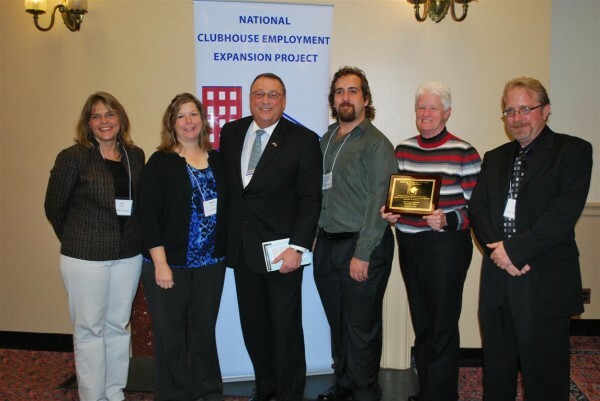 Paul LePage with members and staff of the High Hopes Clubhouse in Waterville at the National Employment Expasion Project in Washington, D.C., on Wednesday. AUGUSTA, Maine — Gov. Paul LePage was honored Wednesday during a ceremony in Washington, D.C., for his work with the High Hopes Clubhouse in Waterville, which offers people with mental illness educational, social and employment opportunities. He was inducted as a Project Employer Advisory Board honoree during the third annual National Employment Expansion Project celebration, which was attended by more than 200 people, including business leaders and staff from the Waterville and Augusta Clubhouses, according to a press release. “The governor’s shared vision that a job is more than work but a part of a person’s identity has assisted with many of our members’ rehabilitation and recovery from mental illness,” Lisa Soucie, director of High Hopes Clubhouse, said about LePage in the press release. LePage has been involved with High Hopes Clubhouse since its opening in 1997. As a member of the advisory board, he focused on people living with mental illness getting opportunities to enter the work force and allowing them to decrease or eliminate public benefits. He also offered and supported the first Transitional Employment site when he was general manager of Marden’s and then as mayor of Waterville. The Maine Clubhouses help people with mental illness gain employment through independent, supported and transitional programs. On Wednesday, the governor also presented awards to staff of Lakewood Continuing Care, Inland Hospital in Waterville and Fairfield Inn & Suites of Augusta on behalf of the National Employment Expansion Project. “I know personally that hiring Clubhouse members is a good business decision. In addition, you are setting an example as an excellent community partner and helping people with psychiatric disabilities to build their confidence and work experience. I know these jobs can transform people’s lives,” the governor said in the press release.